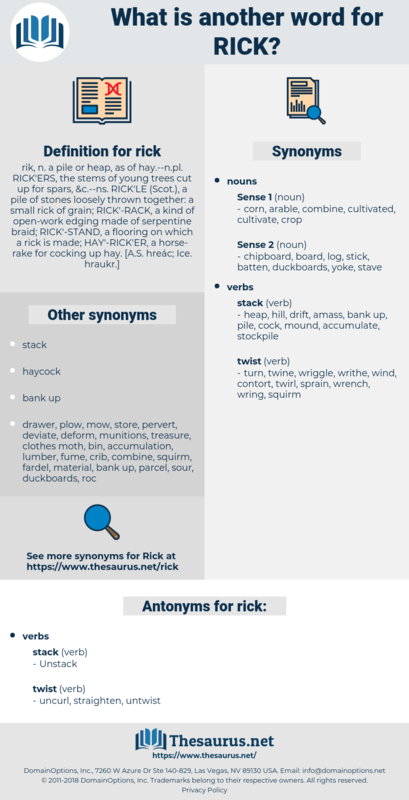 What is another word for rick? Rick tried to figure out all the details.
" 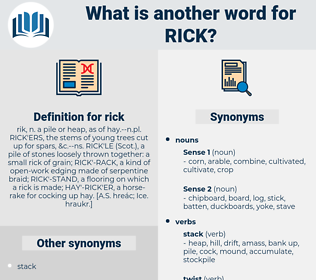 We have one," Rick replied. reich, rough-hew, rejoice, rag week, rosaceous, reissue, recce, roach, RG, raree-show, roccus, ras, rissa, recess, resh, rake, raze, rug, rickey, reseau, rose, rehouse, ragee, rig, reuse, ricke, rask, rouge, rous, rye whiskey, riga, recco, risque, raja, reccy, race, riches, rococo, rejig, rousseau, rocky, rich, roc, raise, raceway, reecho, rush away, rhexia, raj, ross sea, rookie, roux, rushy, rioja, rack, rock, ruscaceae, reek, reassess, Rus, rock cake, rosa, ragi, rorschach, row house, ruck, russia, roughage, rage, rakish, rico, ragusa, rehearse, rash, ross, Reyes, res, roguish, r.c., rusk, resize, rosy, Ric, reggae, rescue, razz, rockchuck, Rya Rug, rachischisis, rouse, rice, roseau, recuse, rook, resew, rush, rockies, re-argue, rough, rosacea, risk, risky, rickshaw, rajah, rose acacia, rugose, racy, rework, rough-house, rag, rachis, rhesus, ruckus, rase, rhus, roughish, roughhouse, rye whisky, raucous, ruse, ruga, Rex, rucksack, rise, ricksha, rogue, rehash, risc, rosaceae, reach, re-echo, ruscus, richea.